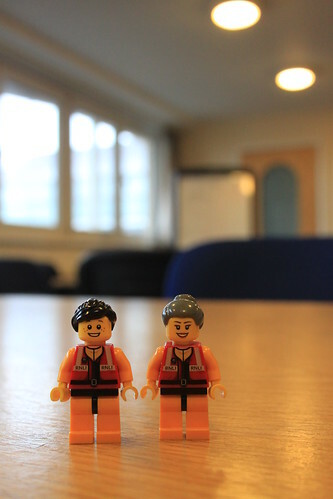 We started in the large crew room, where the station’s crew come together to learn new skills, practice existing ones and keep up to date with what’s happening at the station and across the RNLI. The Crew loved the bright, open space, with its focused atmosphere and views down to the river. 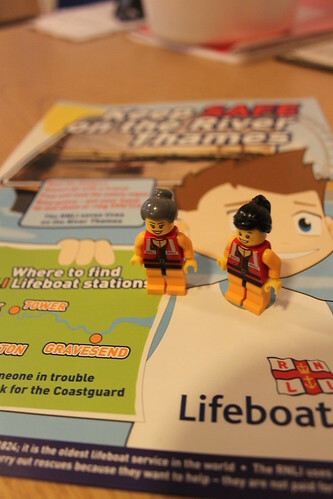 The Crew also took this opportunity to learn more about the RNLI’s work helping people to stay safe when they are in, on or near the river. We all know that the coast can be a dangerous place, but the proximity of the Thames to the city and its urban comforts can all too easily lull people into a false sense of security. 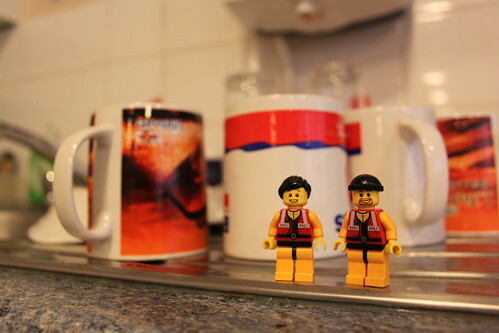 We enjoyed a nice cup of tea with the Teddington crowd, but the little guys were anxious not to get landed with the washing up. 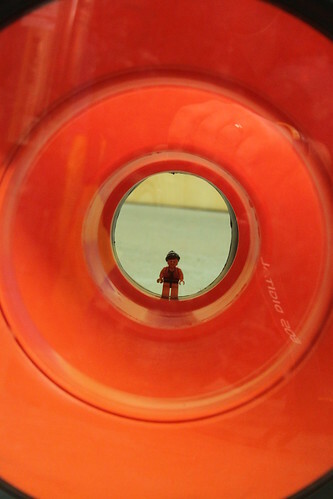 Even a washing up bowl can be treacherous when you’re only an inch and a half tall. At the back of the rather unusual boathouse is the changing room, where the crew store all of their kit. 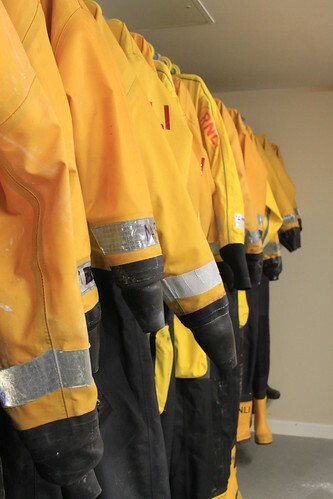 As within any other lifeboat station around the country, the drysuits and lifejackets were all hung up neatly, ready to be donned at a moment’s notice. 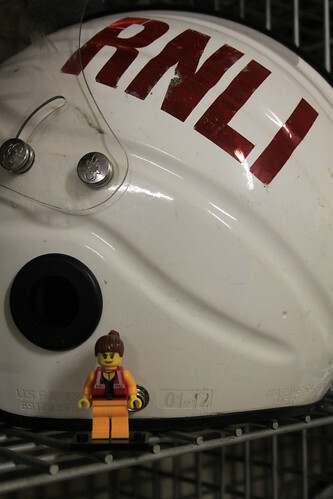 Crew member Susie was hoping to try on one of the rugged drysuits, but sadly the station didn’t have one in her size. She faced the same problem with the helmets. 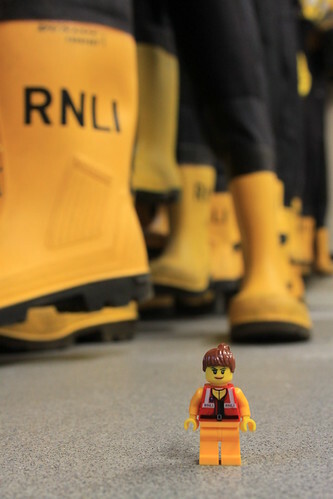 The RNLI helmets are designed to fit comfortably when the wearer has a lifejacket on, can be adjusted to fit the head size of each individual wearer, and have a visor that can be flipped up or down as required. When I was a kid, the RNLI’s inshore lifeboat crews wore what looked very much like a regular motorcycle helmet, so the current kit really is a significant improvement. The last bit of the station for us to visit was the boathouse itself. This was a bit like the world’s cleanest double garage, with an up-and-over door to the front of the building and a door at the back leading from the changing area. 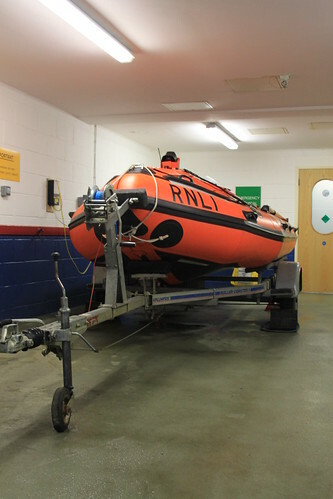 The two lifeboats and their tractor are housed here, ready to go whenever they’re needed. 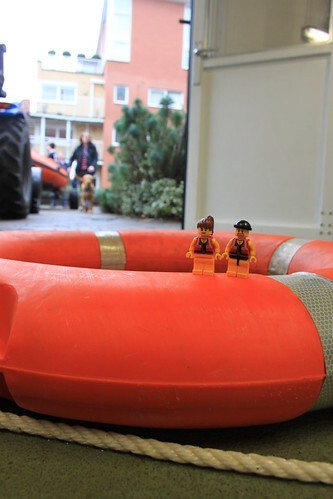 With our tour almost complete, the little guys couldn’t resist the temptation to goof around with some of the bits of kit they found at the station. It’s amazing the fun you can have with a wellington boot, for example. And a life-ring, for that matter. And if you look very carefully in the photo below, you can see my wife (Natalie) and dog (Molly) in the background. 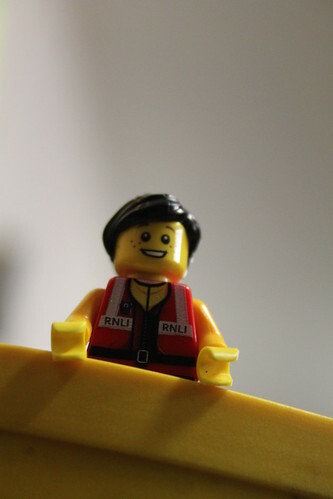 While the little guys and I had been working tirelessly to bring you information on and photos of the station, our support team had been outside surfing the crowd. We even found a bathyscope. 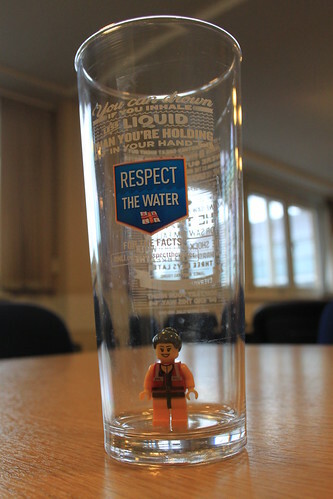 The lifeboat crew can use this to see under water, as it eliminates surface glare and reflections. All from the safety of the boat. But not to be confused with a bathyscaphe, which is a sort of submarine. Or a bathysphere, which is another sort of submarine.